Can Diet Soda Make You Gain Weight? 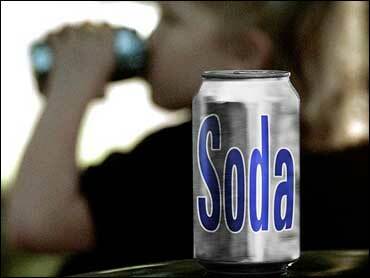 For many people there's only one real reason to drink diet soda. "Because it's got no calories and, yeah, you try to watch your weight," says Raymond Tomczak. But, as The Early Show medical correspondent Dr. Emily Senay reports, some experts are now saying diet soda may be doing the exact opposite: making them gain weight. Epidemiologist Sharon Fowler, from the University of Texas Health Science Center at San Antonio, presented research data on soda consumption to the American Diabetes Association. "What we saw was that the more diet sodas a person drinks, the more weight they were likely to gain," she says. That finding was a big surprise, but it reflected what nutritionist Melainie Rogers saw in her work with obese patients in New York. "When we would switch them on to diet soda off regular soda, we weren't seeing weight loss necessarily, and that was confusing to us," Rogers says. But why would diet soda make some people gain weight? There are only theories at this point but it may be as simple as people consciously eating more because they think they can. Khristianne Corro says, "If I'm having one of those pig out days, then yeah, I figure maybe it'll balance it out a little bit." And Tomczak says, "I'm drinking the diet soda and you know let me have that hamburger and fries, instead of just the hamburger alone." Researchers say physiology may also play a role. "When I put anything to my stomach that's not water then my stomach responds by increasing the gastric acid secretion," Fowler says. "Does that increase my sense of hunger and does that drive me to eat more?" If diet soda really doesn't take the weight off, it wouldn't be the first time a diet product failed to perform as expected. "You know, much the same as when we went through the fat free craze, people overate – not because there was anything wrong with the products, but they overate," says Rogers, the nutritionist. "So we're wondering are we seeing a similar phenomenon with the diet soda." There are still plenty of questions that researchers need to answer. For instance, are these results associated with all artificial sweeteners? Or just certain ones? And of course, it's all just a theory until larger controlled studies can be done, but the early findings are fascinating. In the meantime, there are alternatives for people who are trying to lose weight. There's juice and water or coffee and tea. Dr. Senay says the one thing to take away from this is moderation. Whatever you put in your mouth, don't overdo it. A diet product won't really help you lose weight if you're still getting too many calories from other foods.